Tahoe quakes: business as usual? Does your car get as many miles to the gallon as you expected when you bought it? Have you ever considered buying a hybrid car? An invasive review system by the U.K. government makes the call on who gets research dollars and who's on the chopping block. 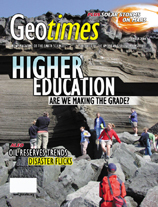 Building Geology for the Future: Cui Bono? Developing an engaged scientific community is the only way to strengthen and save university geology departments. Some geology departments are taking a growth tactic for survival: opening their doors to a wide breadth of complementary geoscience subjects. Who says that serious research and presentation are only for graduate students? Undergrads have more opportunities than you might think. Since Shell downgraded its petroleum reserves earlier this year, several companies have made similar plays, creating more controversy and discussion within the oil industry. Across the United States, people are increasingly removing dams for both safety and environmental reasons. A new program is asking teachers to think big when planning their earth science curriculum. In the cynical world of Capitol Hill politics, there are still some people who inspire optimism among science advocates. A rock, a van, some books and a microscope: Geology gets back to the basics in a university class designed for freshmen. College students examine an 800-year-old basaltic dike at Reykjanes, Iceland. Nine students and three professors from eight different colleges participated in the Keck Geology Consortium Iceland Project in 2003-2004. Read the story on page 32 in the print edition, or online later this month, for more about the Keck program and other opportunities for undergraduate students to conduct and present research. Photo by Brennan Jordan, College of Wooster, and courtesy of the Keck Geology Consortium. Get your copy of the new 2005 AGI Publications Catalog! E mail jr@agiweb.org for more.